Every backyard birder has seen the "starving baby" act by fledgling birds, when they flutter their wings and call piteously for attention from seemingly hard-hearted, indifferent parents. The desire to nurture those fluffy balls of feathers can be strong, but it is important to understand the special needs of a fledgling's diet and know what to feed a baby bird for the best nutrition. Do I need to feed this baby bird? Baby birds have very demanding dietary needs. Depending on their age and species, baby birds may eat every 10 to 20 minutes for 12 to 14 hours per day, consuming a diet rich in insects for sufficient protein to ensure healthy growth. No human other than a licensed bird rehabber has the proper equipment, food supplements or endurance to keep up that frantic feeding schedule. If you find a baby bird that appears to need feeding, the best thing to do is not to feed them, but to get them to an appropriate bird rescue organization. In many cases, the begging birds are not abandoned and the parent birds are nearby and tending to their babies as needed, even if they aren't seen. If you find a baby bird that seems to be unfed, watch the bird closely for 1 to 2 hours to see if the parents return to feed it. Bear in mind that it may take just seconds for a parent bird to deliver a bite to their chick, and inattentive observers may miss several feeding cycles. As the chicks grow, feeding may also be less frequent, and one parent bird may be tending to several offspring in different locations, so parental visits may be uneven. If the baby is being fed, rest assured that the parent bird is well able to keep up with its demands, and no intervention is necessary if the baby does not appear injured or ill in any other way. If the baby bird is not being fed and appears to be growing weaker and more lethargic, the first step should be to find a licensed rehabber to provide it proper care. When contacting the rehabber, ask for their evaluation of the bird in question before attempting any emergency feeding. If they recommend feeding the baby bird, they may have specific suggestions in mind as an emergency measure, and those suggestions should be meticulously followed. 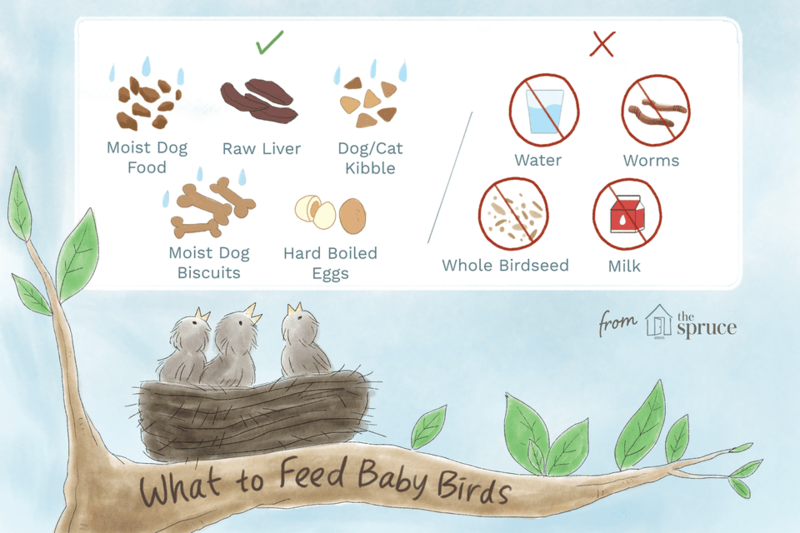 If you find a baby bird that needs to be fed but are unable to contact a bird or wildlife rehabilitator, it is important to know what to feed a baby bird that will provide similar nutrition to its natural diet. While every wild bird has a different diet, several types of food can serve as emergency rations when necessary. At the same time, it is critical to understand that baby birds have very different nutritional needs than adult birds, and foods you would normally feed to your backyard birds are not appropriate for young fledglings. The more mature a baby bird is, the more "adult" food it can consume without harm, and the longer it can go between feedings. Offer food that is spongy in texture, not dripping with water that could cause choking or drowning. All dry food should be softened before being offered to a baby bird. Food should be offered at room temperature only, never warmed or heated, and also never refrigerated or chilled. Keep bits of food small and in proportion to the bird's size; very small birds need very tiny bites. Cut or crush food appropriately to suit the bird's size. While feeding the bird, handle it as little as possible to minimize the risk of additional stress or injury. Never force the bird's bill open to eat. Above all, remember that feeding a baby bird should be an emergency measure only. If a baby bird is abandoned and needs care, it should be taken to a bird rescue organization or experienced rehabber as soon as possible. Rehabbers can not only feed it an appropriate diet for its species but can help it learn how to find its own food, evade predators and learn other skills necessary for a successful life in the wild. Do These 5 Things and You Are Hurting Baby Birds! You Found a Baby Bird - Now What? What Is a Baby Bird Called? Be Festive - Decorate a Christmas Tree to Feed the Birds! What Kitchen Scraps Can You Feed Birds?